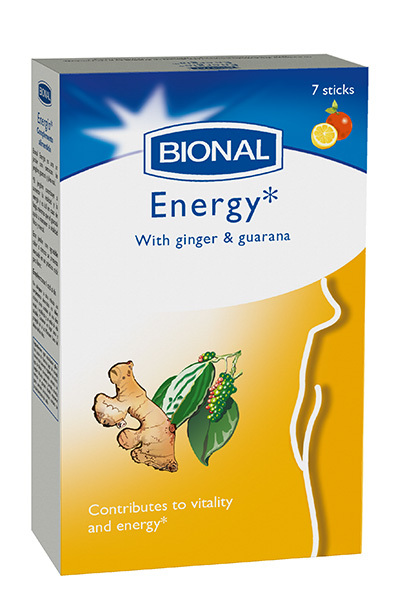 Bional Energy is a liquid formula with ginger and guarana extract and royal jelly. *Ginger helps to increase vitality and energy, and is useful in case of fatigue, while the Guarana helps to maintain physical and mental vitality. This pleasant tasting liquid with citrus flavor is packed in a handy stick. 1 stick a day. Squeeze the content of 1 stick directly into the mouth. Keep dark and dry, and away from young children. Water; stabilizer: glycerol; fructose syrup; concentrated orange juice; royal jelly; acidity regulator: concentrated lemon juice; liquid ginger extract; flavour: grapefruit, orange; liquid guarana extract; thickener: xanthan gum; preservatives: potassium sorbate, sodium benzoate.